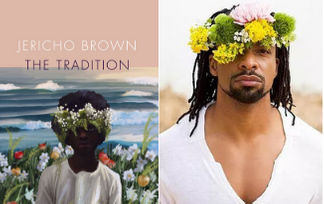 Our spring intern, Kelsey Beyeler, shares some thoughts on reading visiting poet Jericho Brown’s THE TRADITION. Please come out to hear Jericho read along with Destiny Birdsong, and along with musical performances by Jason Eskridge and John Shakespear, on May 4 at Analog at the Hutton Hotel! -Ed. Jericho Brown is a poet, professor, activist, and self-described “victim of life.” His testimony to these roles shows up in his writing, which has netted him an impressive list of literary accomplishments including a Whiting Writers' Award and fellowships from the John Simon Guggenheim Foundation, the Radcliffe Institute for Advanced Study at Harvard University, and the National Endowment for the Arts. Brown’s perspective is powerful--and it isn’t always pleasant, or comfortable. As a straight, white reader, my encounter with his poems left me wondering: Where does my opinion fit in with all of this? I realized all I could do was read the poems and pay close attention to how they made me feel. When I couldn’t relate personally to a poem, I just sat back and listened to what it had to say. In doing this I was able to experience a new voice that’s never lived inside my head, and therefore see the world from a new perspective that helped broaden my own. The Tradition made me feel and think deeply on the topics of racism, masculinity, and sexual identity. Though Brown may be writing from a place that is different from my own, ultimately we are all connected, and his writing showed me that, too. Poems like “Bullet Points” and “Entertainment Industry” create a space where we, as Americans, can ruminate on our nation’s scars, and mourn the wounds that are still open. The Tradition helped deepen my understanding that we are all connected as sons and daughters, siblings, victims, survivors and lovers, no matter our backgrounds and orientations. The poems coaxed unexpected emotions out of me, and forced me to acknowledge them, even when it was uncomfortable. On May 4th, Brown wlll host a poetry workshop for The Porch titled “Jumpstart Your Engines” in which he will help students generate new work through a set of unconventional exercises that keep our ears open and our fingers moving. This workshop is cosponsored by our friends at Vanderbilt’s Curb Center. Later that night, he will join poet Destiny Birdsong, and musical talents Jason Eskridge and John Shakespear, to read from his new collection. The event will take place at Analog at the Hutton Hotel, and you can click here to reserve your spot.